Brazing two thin brass plates together using SSF-6 silver solder and a propane torch. MAPP gas or oxygen acetylene would be just as effective for this application. 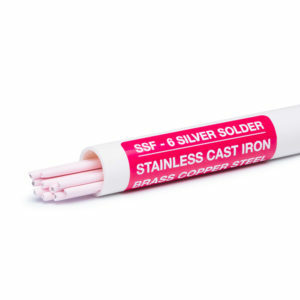 SSF-6 flows at a lower temperature than most silver solders so you are not in danger of warping the parent metal–SSF-6 can flow up to 18 inches per inch of rod. The strength of this rod is that of MIG welding, but grinding or machining are unnecessary, due to the pleasing natural finish of the silver solder.